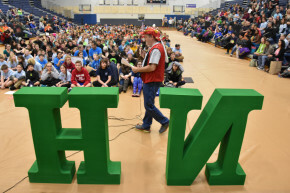 Over the next two weeks, over 1,800 New Hampshire students will have their problem-solving, collaboration and creativity skills tested at Destination Imagination Regional Tournaments around the state. Student teams will be leveraging these skills in solving open-ended challenges based in science, technology, the arts, engineering, math and service learning. Over 300 teams including 111 in Kingston and 27 in Berlin will kick off competition this weekend with two more tournaments next Saturday in Goffstown and East Swanzey. Top scoring teams in their selected challenge and age group from each tournament will advance to the Destination Imagination State Finals on April 1 in Bedford. The top scoring teams will qualify to advance to compete with teams from virtually every state and teams from 20 countries at Destination Imagination Global Finals. More information about the tournaments, including schedules, are available on NH-DI.org.